Hello! Welcome to my very first quiz! BTS is a k-pop (Korean pop) boy band. BTS stands for bulletproof boy scouts, and their fans are called A.R.M.Y's. They are very good singers, dancers and rappers. Please check out their songs on BigHit Entertainment if you haven't! This quiz will show you which member in BTS you are, the possible results are Jin, Suga, J-Hope, Rm, Jimin, V and Jungkook, answer the questions and once you're finish you'll find out who you are! Enjoy! how much do you love eating? which of the following are you good at? if you were in a k-pop group what would you be? what type are you when you're at home? "You will always be handsome"
"You are good at everything"
"You have a good game"
"You're my hope, i'm your hope, we always have hope"
what is the most important thing of yours that you take anywhere? 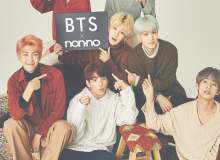 Quiz topic: Which member of BTS am I?